Sarah Nader - snader@shawmedia.com Marian Central's A.J. 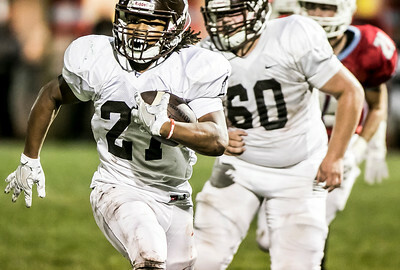 Golembiewski runs to the end zone to score a touchdown during the first quarter of Friday's football game against Joliet Catholic in Woodstock Sept. 23, 2016. 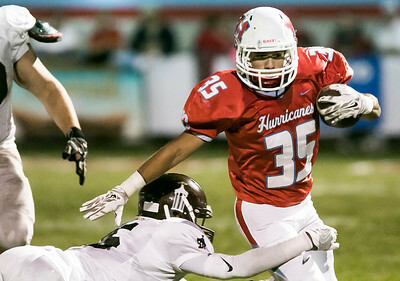 Marian Central won, 28-15. 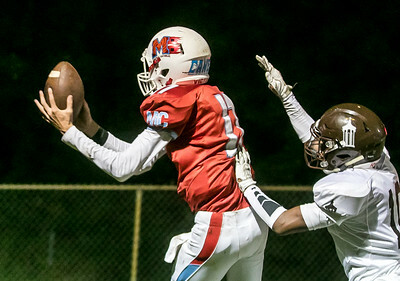 Sarah Nader - snader@shawmedia.com Marian Central's Gavin Scott throws a pass during the second quarter of Friday's football game against Joliet Catholic in Woodstock Sept. 23, 2016. Marian Central won, 28-15. 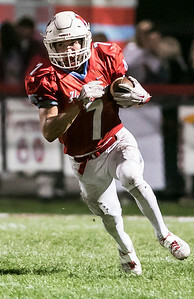 Sarah Nader - snader@shawmedia.com Marian Central's Gavin Scott runs the ball during the second quarter of Friday's football game against Joliet Catholic in Woodstock Sept. 23, 2016. Marian Central won, 28-15. Sarah Nader - snader@shawmedia.com Marian Central's A.J. 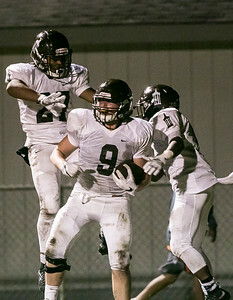 Golembiewski (center) celebrates his touchdown during the first quarter of Friday's football game against Joliet Catholic in Woodstock Sept. 23, 2016. Marian Central won, 28-15. Sarah Nader - snader@shawmedia.com Marian Central's Anthony Silva is taking down while running a play during the first quarter of Friday's football game in Woodstock Sept. 23, 2016. 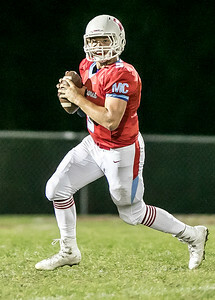 Marian Central won, 28-15. Sarah Nader - snader@shawmedia.com Marian Central's A.J. Golembiewski catches a pass during the second quarter of Friday's football game against Joliet Catholic in Woodstock Sept. 23, 2016. Marian Central won, 28-15. 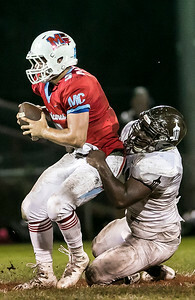 Sarah Nader - snader@shawmedia.com Marian Central's Gavin Scott is sacked by Joliet Catholic's Deonte Berry during the second quarter of Friday's football game in Woodstock Sept. 23, 2016. Marian Central won, 28-15. 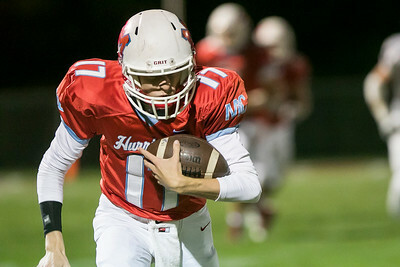 Sarah Nader - snader@shawmedia.com Marian Central's Brian Niemaszek runs the ball during the second quarter of Friday's football game against Joliet Catholic in Woodstock Sept. 23, 2016. Marian Central won, 28-15. 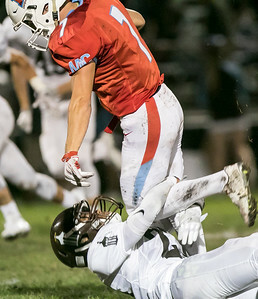 Sarah Nader - snader@shawmedia.com Marian Central's Brian Niemaszek is taken down by Joliet Catholic's Michael Cruickshank during the second quarter of Friday's football game in Woodstock Sept. 23, 2016. Marian Central won, 28-15. 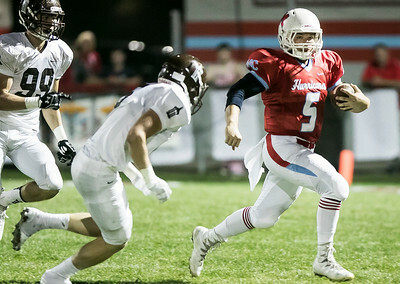 Sarah Nader - snader@shawmedia.com Marian Central's Jared Churak (left) tries to hold back Joliet Catholic's Michael Butler while he scores a touchdown during the second quarter of Friday's football game against Marian Central in Woodstock Sept. 23, 2016. Marian Central won, 28-15. 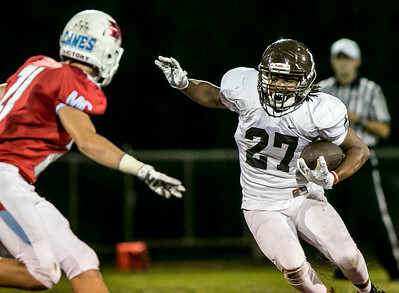 Sarah Nader - snader@shawmedia.com Joliet Catholic's Keenan Hailey runs the ball during the first quarter of Friday's football game against Marian Central in Woodstock Sept. 23, 2016. 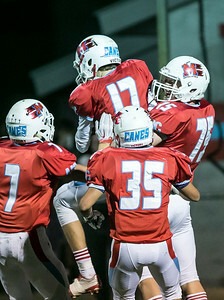 Marian Central won, 28-15. 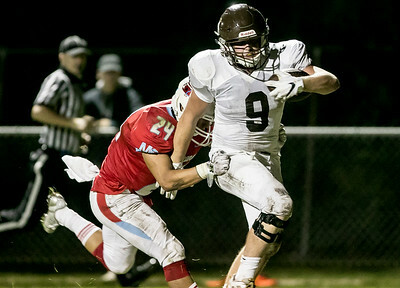 Sarah Nader - snader@shawmedia.com Joliet Catholic's Michael Butler (center) celebrates his touchdown during the second quarter of Friday's football game against Marian Central in Woodstock Sept. 23, 2016. Marian Central won, 28-15.